Welcome to the world of Teradandra. The King is dead. Spire Tree, the fortress of the elves, has fallen. The cornerstone of peace reduced to chaos and the line of Silverwood ended, or is it? From the rubble, an elite Guardian from the realm of Dayspring locates the King’s hidden treasure and rescues her before her existence is discovered. Going into hiding the Guardian raises the elf child for fourteen years until, by accident, her existence becomes suspect. Hunted down, the Guardian and his ward race across the five realms of Teradandra looking for allies that can help protect her and locate the one artifact – a talisman – that can confirm to the world that she is indeed the heir to the throne of Silverwood. With time running out and the talisman broken apart into five pieces, the Guardian and his allies race against the dark forces of chaos to keep the princess alive and recover the talisman. Only then can peace be restored to the five realms. 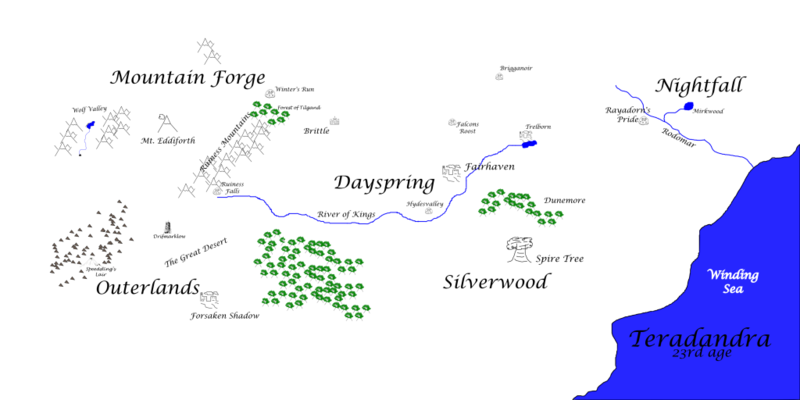 Only then will the realm of Silverwood be restored.